It's time to fight like a girl! Vivian Carter is fed up. Fed up with her high school teachers who think the football team can do no wrong. Fed up with sexist dress codes, hallway harassment and gross comments from guys during class. But most of all, Viv Carter is fed up with always following the rules. Viv's mum was a tough-as-nails, punk rock Riot Grrrl in the '90s, and now Viv takes a page from her mother's past and creates Moxie, a feminist zine that she distributes anonymously to her classmates. She's just blowing off steam, but other girls respond and spread the Moxie message. 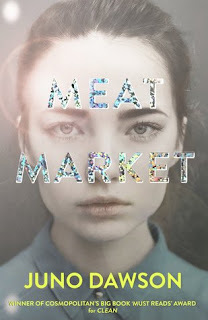 As Viv forges friendships with other young women across the divides of cliques and popularity rankings, she realises that what she has started is nothing short of a girl revolution. 5 Words: Family, school, feminism, Grrrl Power. 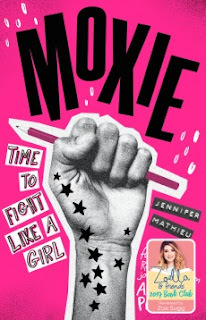 MOXIE IS INCREDIBLE GET IT AND READ IT NOW. IT MADE MY HEART SING AND MADE ME CRY HAPPY TEARS. SORRY THIS REVIEW IS A COP OUT BUT I LOVED IT SO MUCH I DON'T HAVE WORDS. Hi, this is not the sort of book I would read, but your 5 word summary makes me want to give it a try. Thanks for sharing. Yesss for an excellent feminist read! Everyday sexism can be so difficult on the soul, so this book sounds like a must-read!